Even though we all know that past performance is a very imperfect guide to future performance, it is still a major factor for many investors – if not the major factor – in the manager selection process. It is therefore natural that managers seek to present their performance numbers in the most favorable light possible. But it is still unfortunate that many of them insist on presenting meaningless, if not misleading, cumulative performance charts in their reporting to clients. Consider Chart 1, taken from the monthly report of a very large, very successful US-based hedge fund. The fund does not allow its materials to be distributed further, so the chart is a simplified version of the original based on annual rather than monthly data. The fund performance is in blue, the HFRI Fund Weighted index in red. I actually found myself rather impressed by the fund’s results. It has generated an annual compound return of over fifteen percent since its inception in 1990 with single digit volatility. Only one year – 2008, of course – generated a small negative return. So where is the problem? When I am confronted by historical performance data, I am particularly interested in the pattern of absolute and relative returns. Are there specific periods when the fund has done particularly well or badly? How has it done in the various periods of crisis? Has there been a major change to the volatility of the returns? Have there been any patterns in the performance relative to its reference index? Chart 1 does not allow us to answer any of these questions. Instead, it gives the misleading impression that not only has this manager been successful but he has actually gotten better and better – one very good reason why this type of chart is popular with managers. Naturally, the “getting ever better” is an illusion due to the use of a linear scale on the vertical axis. With a linear scale, the steepness of a given return depends on the starting point. A ten percent return on an index level of one gives an increase of 0.1, the same return on an index level of, say, three, gives an increase of 0.3. This means that we cannot obtain a correct visual impression of performance – or volatility – through time without digging further into the data. Is there a better solution? There is indeed and it is a very simple solution. With the use of a logarithmic scale, any given performance appears in the graph with identical slope regardless of the level of the return index. Thus, a constant return through time is simply represented by a straight line. 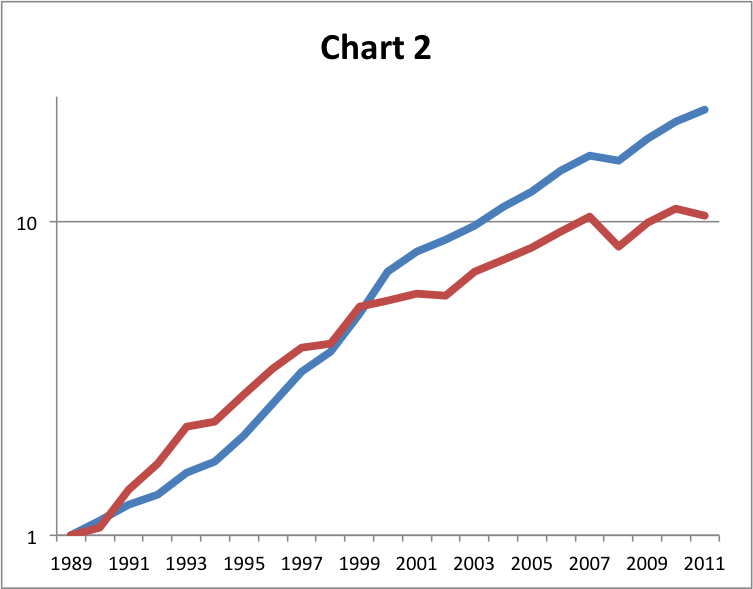 Chart 2 shows the same information as Chart 1 but with a log scale on the vertical axis. The differences are quite striking. Chart 2 allows me to answer the questions from the previous paragraph. The fund’s performance has not been getting better and better but returns in the recent past have actually been rather weaker than in the nineties. Up to the year 2000, the annualized return of the fund was just over nineteen percent, for the past eleven years that number dropped to just over eleven percent. This is not a surprise. As Graph 2 also shows, the HFRI index shows an even greater deterioration in performance after the “golden age” of hedge funds in the nineties. It also becomes apparent that the outperformance of the fund over the HFRI index is concentrated in a few years – between 2001 and 2005, the lines run parallel indicating similar performance. Thus, simply using a log scale, it becomes possible to compare performances directly both in absolute and relative terms through time (even though the graphs in this post are obviously too small to lend themselves to a very detailed analysis). 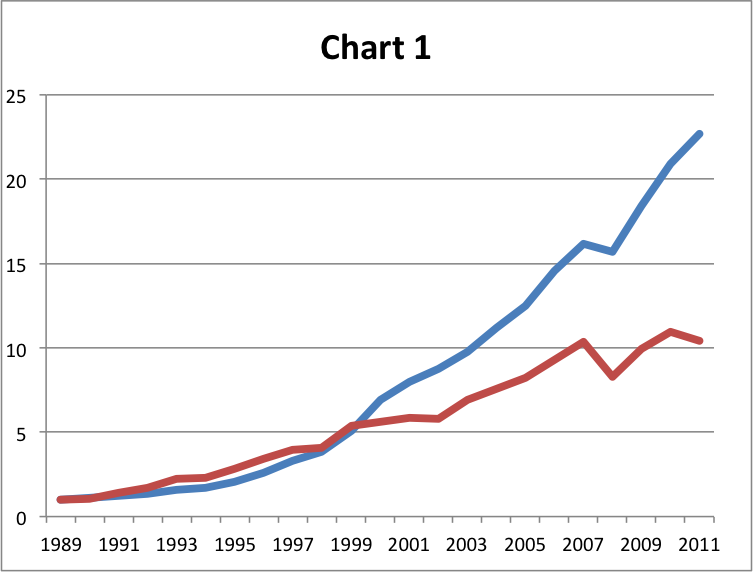 Why do many asset managers like to show such misleading graphs? The main reason is probably that they have not given it much thought. Admittedly, the choice of scale is not exactly a question of life or death. Note that the use of a linear scale for long-term performance graphs is much more appealing for low volatility products. Volatile products such as small cap equity funds would also give the impression of having become much more volatile recently, which is presumably not an attractive quality. 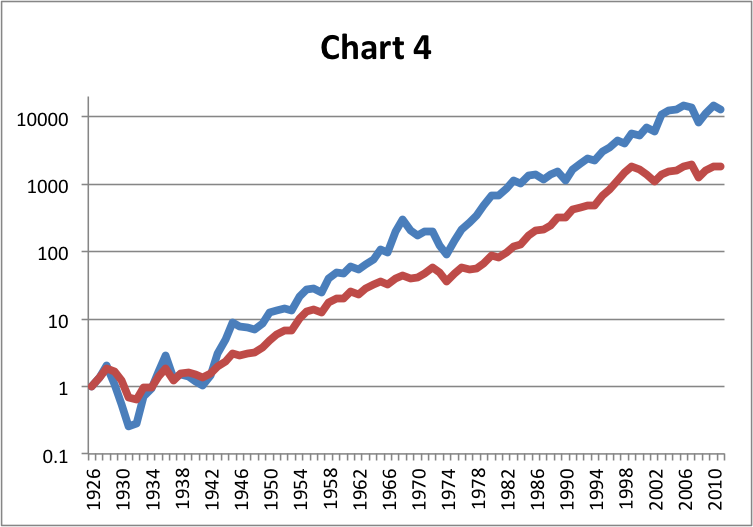 See Charts 3 and 4 for US small cap and large cap returns since 1926 (small cap in blue, large cap in red) taken from Ken French’s website. 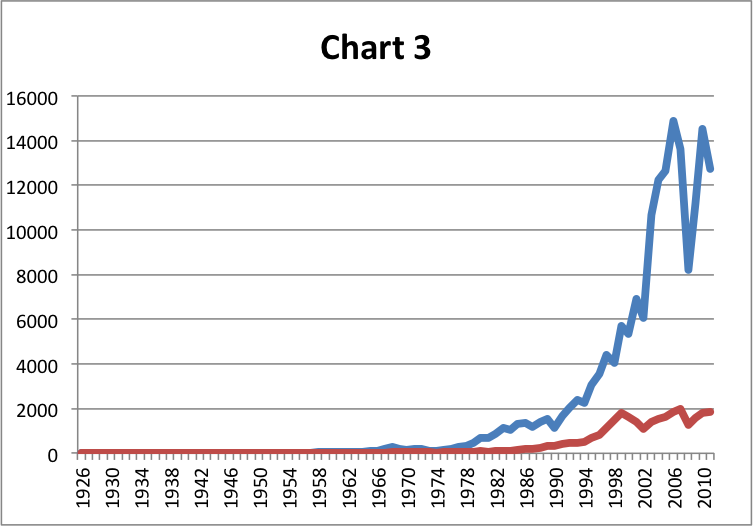 The information in Chart 3 is obviously meaningless, Chart 4, however, shows periods of under- and outperformance of small caps – the divergence or convergence of the two lines – as well as periods of high and low volatility very clearly (again, within the limits of the scale of the chart). To conclude, the meaningful visual analysis of a long-term cumulative performance record requires a log scale on returns. Consequently, clients should encourage managers to change and show performance charts for extended periods using such a scale. But what is an “extended period”? I would argue that the higher the volatility, the shorter the time period for which the use of a linear scale still makes sense. For products with double digit volatility, the limit might be two years or less. For less volatile products, three to five years appears to be a sensible cutoff.